Welcome to New Orleans and to CEER 2014! Following five leadership forums convened by the America’s WETLAND Foundation for its Big River Project, this session will establish the context for action required to successfully manage the Mississippi River system and ensure the integrity of its natural resources and assets. As one of our Nation’s most important natural resources, the Big River is the answer to much of what challenges us, but its future potential depends on providing an aggressive approach to its stewardship. In this session, some of the foremost leaders with River interests will discuss: (1) why the Mississippi River territory is essential to all living things, (2) how stains of the Mississippi River will lead to loss of ecosystem values that the River provides, (3) how to imagine a new view of water management in America that includes consideration of ecosystem sustainability challenges, which is essential if we are to have an environmentally sound and economically prosperous asset in the River, and (4) how federal programs, such as programs for healthy soils incentives for farmers, can result in a flowing river that is less toxic and problematic to river's end hypoxia challenges that threaten Gulf Coast waters, impacting marine life and the states along the coast. In this session, SER’s international leaders will discuss restoration in an international context, highlighting restoration achievements and approaches in their global regions. 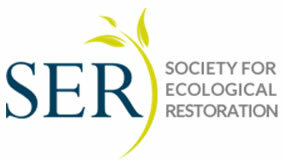 The SER Science and Policy Committee’s (SPC’s) mission is to develop and consider policy and scientific matters of direct relevance to SER members and to the science, politics, economics, business and practice of ecological restoration worldwide. 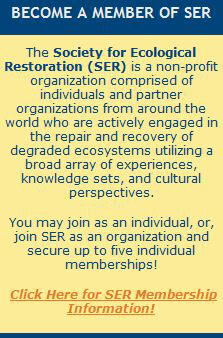 SER impacts global policy directly through ongoing involvement in global restoration efforts, specifically with the International Union for Conservation of Nature (IUCN), United Nations Convention to Combat Desertification (UN-CCD) and the United Nations Convention on Biological Diversity (UN-CBD). The session will conclude with a discussion of SER’s new large-scale ecosystem restoration section (LERS) which provides a forum to collaborate internationally. This discussion will focus on restoration plans and programs such as RESTORE, NRDA, the Gulf Environmental Fund and the Louisiana State Master Plan. Speakers will consider: (1) how these components will work together to maximize comprehensive ecosystem restoration, (2) what challenges the community of practice represented at the conference should work to address, and (3) how we will account for outcomes, both technically and to the public, in truly adaptive execution—a question that former Senator Bob Graham emphasized repeatedly in deliberations of the Oil Spill Commission. Following brief opening presentations by each panelist, the session’s moderator, Don Boesch, will facilitate a discussion among the panelists and with the audience. This session will focus on how to recalibrate systems and levels of funding available for ecosystem restoration. The defining characteristic of restoration funding over the last two decades has been post-disaster response. The need for strategies for responding to climate and other environmental changes through restoration and adaptation far surpass any estimate of the resources available for such efforts. Systems based approaches to addressing these issues are preferred, but individual project funding is dominant. Even where integrated planning is in place, financial needs far outstrip government resources. This plenary discussion is intended to bring together experts who can provide provocative ideas that might lead to new approaches to both systems and financing of ecosystem restoration initiatives. Speakers will reflect on the following questions: (1) How do we fund restoration work above and beyond current federal and state levels, (2) How do we create systems that allow use of funding provided by non-profits and for profit entities, in addition to federal and state funds, (3) How do we implement valuation of ecosystem services, and (4) How do we concretely demonstrate and communicate restoration benefits to stakeholders and communities?